To protect space station K7 with a vital grain shipment, Kirk must deal with Federation bureaucrats, a Klingon battle cruiser and a peddler who sells furry, purring, hungry little creatures as pets. "The Trouble with Tribbles" the 15th episode of the second season and 44th episode overall. It was first broadcast in the United States on December 29, 1967, on NBC. The episode was the first professional work of writer David Gerrold, and went through a variety of drafts before it reached the screen. Because of an error in the size of typeface, an approved version needed to be reduced by twenty pages before filming. Nichelle Nichols remarked that she had "never seen a script go through so many changes—and stay so much the same". This iconic episode was directed by Joseph Pevney and remains one of the favorites among many Trek fans. ...Or you can watch the episode as a handy .Gif. 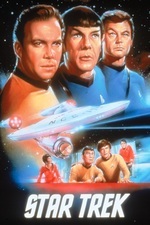 This was the very first TOS episode I can remember watching all the way through, by virtue of the series being released on VHS near the beginning of the TNG era, and it might be the episode that I've watched the most times individually. Kirk getting buried in Tribbles was pretty much my introduction to the "rewindable moment" in home video, and a legitimately great physical comedy bit in a series that isn't necessarily known for them. I'm required by law to mention my parody music video recap. This episode messed me up for years. After watching this, I could only think/hear/read 'tribolites' instead of 'trilobites'. Funny how the future can muck with the past. I assume my fellow Trekkies have seen the DS9 episode Tribbles and Tribble-ations, but if not it's time to fire up the Netflix. That episode serves as a tribute to the original series, taking the DS9 characters and inserting them into this story. It's a really clever, fun hour of TV for any Trek fan. Why do they even have that door, if the grain was still in there he'd have been buried in grain. I guess it's a sign of how fun this episode was that the 'why do we even have that lever?' thought never crossed my mind until this re-watch. A bit of trivia -- the food processors scene is one of the few in the entire series where you can see Doohan's war wound (friendly fire, finger shot off by a perimeter sentry on Normandy beach, but it got him a trip home and then a transfer to the Canadian Air Forces); normally the actor did his own blocking so that you wouldn't see it. Also, apparently picking up that one fat tribble in the third act and walking around with it afterward was Shatner's on-set improvisation. I don't know how that worked with the filming schedule. One interesting thing to note is how late in the episode the utter infestation arrives. The tribbles being everywhere is pretty much all in the second half. The "no tribble at all" gag by Scotty was recapitulated in Galaxy Quest with the stone monster. Couldn't find the clip. Presaged a lot of inconsistent interaction of transporters, shields, and sensors, in retrospect. Back in the 1970s David Gerrold published a nonfiction book about the experience of making this episode. It's a pretty unique inside perspective on the series, and for someone who in the end only sold one episode to TOS (though he had much more to do with the the reboot series') he had a remarkably in-depth experience with the cast and production team. Vanity Fair: "Inside 'The Trouble with Tribbles,' Fifty Years Later."